As we passed Labor Day, the minor league season has come to an end. Next week, we’ll start announcing the Twins Daily Minor League awards for 2018. This week, we will celebrate the strong performances from the season’s final month. It may be surprising that August marks the first time that we have a repeat winner for Hitter of the Month. It probably won’t surprise you to learn which player is the repeat winner. Let’s take a look at the Top 4 hitters for the month of August, but first here are some players deserving of honorable mention. Luis Arraez - Chattanooga Lookouts - 28-81, .346/.393/.444 (.838) with two doubles and two homers. Colton Burns - Elizabethton Twins - 16-51, .314/.435/.627 (1.063) with four doubles and four home runs. Trevor Casanova - Elizabethton Twins - 19-52, .365/.397/.577 (.973) with five doubles, two homers, seven RBIs. Trevor Larnach - Elizabethton Twins/Cedar Rapids Kernels - 30-105, .286/.364/.476 (.841), nine doubles, one triple, three homers, 12 RBIs. Luke Raley - Chattanooga Lookouts - 23-84, .274/.382/.440 (.823) with one double, two triples, three homers and 13 RBI. Ben Rodriguez - Cedar Rapids Kernels - 24-91, .264/.358/.462 (.819) with ten doubles, one triple, two homers and 20 RBIs. Ben Rortvedt - Ft. Myers Miracle - 16-56, .286/.344/.464 (.809) with five doubles, one triple, one homer and ten RBIs. Number 4 – Chattanooga Lookouts - Jaylin Davis - .290/.368/.473 (.841). 27-93 with five doubles, four home runs and 15 RBIs. 2018 has been a year of improvement for Jaylin Davis. He has dropped his strikeout rate some and increased his walk rate. He has successfully moved from High-A to Double-A. In the final week of August, Davis learned that he would be representing the Twins in the Arizona Fall League. While Davis is not a big man, he is incredibly strong and full of power potential. He will need to continue showing plate discipline and strike zone judgment, but he’s put himself in a good situation going into 2019. Number 3 - Cedar Rapids Kernels – 2B Michael Helman - .367/.407/.510 (.918), 36-98 with six doubles, one triple, two homers and 14 RBIs. The Twins were excited that Helman, a shortstop from Texas A&M, was available when they made their first pick on Day 3 of June’s draft. Since signing officially on the final day, he has primarily played second base. He has also been hitting pretty much from the start. In 12 games in Elizabethton, he hit .375. In 26 games with the Kernels, he has hit .359. Over his final seven games of the month, he hit .429 (12-for-28) with three doubles and a homer. He had 12 multi-hit games in 24 games played during the month including his first three (and four of his first five) of the month after being promoted. Number 2 - Cedar Rapids Kernels – SS Michael Davis - .289/.312/.578 (.890), 26-90 with six doubles, one triple, six homers and 21 RBIs. With how quickly Davis has adjusted to pro ball and life in the Midwest League, one can’t help but wonder how it is possible that Michael Davis was available to the Twins in the 24th round of this year’s draft. After just three games in Elizabethton, Davis was promoted to Cedar Rapids where he hasn’t missed a beat. While it could potentially be hard to maintain success with the 31 strikeouts/3 walk ratio he had in August, when you produce the kind of power he produced, it can be very impressive. Not only that, but he’s playing a solid shortstop as well. Over his final seven games of the month, Davis hit .519 (14-for-27) with a double, triple, homer and 15 RBIs, helping the Kernels earn their 2nd half division title. 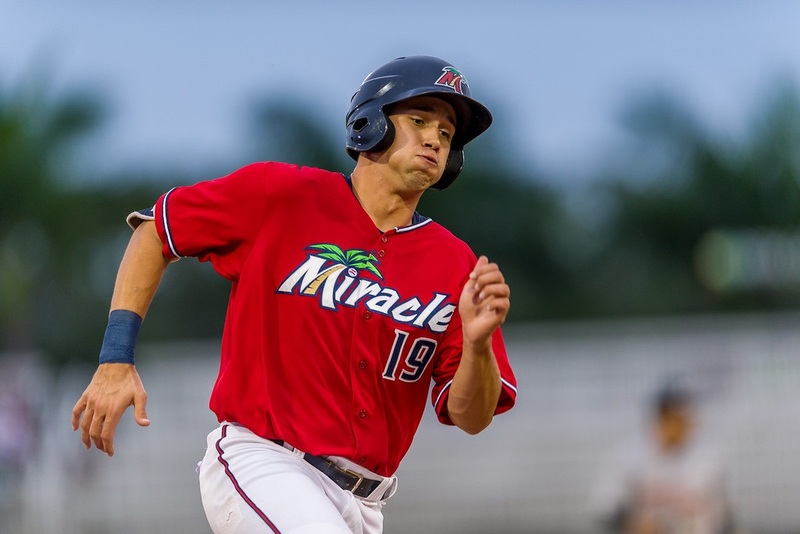 Ft. Myers Miracle – OF Alex Kirilloff - .351/.387/.550 (.936), 39-111 with ten doubles, four homers and 16 RBIs. Kirilloff put together one of the best seasons in recent Twins minor league history. He was our choice for Minor League Hitter of the Month in May and now again in August. Interestingly, Kirilloff’s OPS for the month of August was under 1.000 for the first time since April. But he led the Miracle to a playoff berth on the last day of the season. He continued to provide doubles and added more home runs during the month than he had previously with the Miracle this year. The former first-round pick finished his first full season of playing as a professional with 44 doubles, seven triples, 20 home runs and 101 RBIs. We would like to congratulate Alex Kirilloff, Twins Daily’s choice for Minor League Hitter of the Month for August 2018. Feel free to share your thoughts and ask questions. Looks to me that Kiriloff will be the minor league hitter of the year.Next year will be key as he will almost certainly start in Chattanooga. Kirilloff should have been the hitter of the month every month. 71 extra base hits, that's just impressive no matter how you look at it. I really hope he gets a ST invite and I really look forward to seeing him and Lewis in Chattanooga next year. Should be some awesome baseball. Alex won't be lining up in CF anytime soon. He's even acknowledged that he's still working hard to improve his defense. I'm excited about Ben Rortvedt - playing good catcher, and holding your own at the plate with good plate discipline when you are a full 2+ years younger than league average is pretty heady stuff. Kiriloff - what a season. Like pre-knee injury Kubel. Good to see Rortvedt hanging with the big boys.if he keeps improving with the bat we might actually have a good young catcher in our system for the first time in a long time. I'm excited about Rortvedt too. He took a very important step forward as a hitter this year. It shouldn't have been a surprise for him to have improved as a hitter when repeating a level for the first half of the season, but he kept it up after moving up to Ft. Myers, where he was young for the level and it's generally known as a pitcher's league (Alex Kirilloff not withstanding). I suspect he'll start the year in high A again next year and if he continues to hit like he did this season he'll move to AA around midseason. But the improved hit tool makes him a real live prospect now. Curious, Seth, who from the past you feel had seasons similar to AK?Could be interesting comparing their later success to where we think AK can go...or beyond? Add me to the list of those excited about Rortvedt's future.Expect some of our excitement comes from catching depth being a position of need for the Twins.Must state, however, that I am also pleased with the success Garver made this year.Garver-Castro should be fine for the Twins until Ben gets here and shares the spot with Mitch. And what can anyone say about two diamonds in the rough the Twins found with Helman-Davis.Should they develop into quality big leaguers, these type of later round finds can make a good team better. Yeah, the keystone combo out of Texas looks real solid. If I'm responsible for drafting Davis and Helman, I'm feeling pretty good about it. Maybe they can progress through the system together. I can dig it. Davis (bats L) improved every year at Texas Tech. Average, On Base and Slugging. Helman (bats R) gave up his senior year at A+M to join the Twins. Good luck in the playoffs boys. Kick it. It will be nice to see Lewis get a chance in the playoffs to end the season with an exclamation point. Nah, it would only be a jinx if Kirilloff was playing in the Arizona Fall League. Didn't Jeffers have a really solid August moving up a level and ranking after adjusting? No errors or passed balls at Cedar Rapids? Like hon. mention for hon. mention maybe? 2nd rounder looking good so far. Is it just me or is it a little depressing that none of the considered hitters are at the AAA level, and only 2 (Arraez and Davis) at AA? Looks like reinforcements from below may be a long way off. Hopefully Gordon and Wade can rebound and make it up next year. They definitely did not deserve promotions and need more seasoning. Rooker is highly likely to make his debut next year. I predict he forces his way up the first half of next year. Kiriloff has been moving quickly as well. I would not be surprised to see Kiriloff force his way up in the second half next year as well. I'm with you on Kiriloff and optimistic enough to hope Lewis isn't far behind. I agree on Rooker and think Wade could be a high OBP guy in MLB - strong 4th OF, average to belwo average starter since he can't play a regular CF. I'm not as high on Gordon but I'm hoping this is a 22 year old bump in the road. And Buxton and Sano will bounce back and we'll have unicorns throwing out first pitches. I'm just very skeptical given the complete lack of success the Twins have had getting minor leaguers up to the pros and succeeding there. 2020 might be an interesting year, but I'm not exactly looking forward to 2019. Maybe Gordon, Wade, Kiriloff and Rooker will be added in September 2019. Luis Arreaz seems to be one of those guys overlooked by the fans. Next year he should at least start at Rochester and won't turn 22 until after the year starts. He finished hitting over 300 again with a 360 OBP. For his career he's at 329 with an obp over 380 and OPS at near 800. It doesn't look like he'll ever be a home run hitter or great base stealer. I could see him hitting second with his good obp and excellantcontact as his career minor league strikeout rate is only 8.5% Maybe somebody for the big boppers to drive in. He seems to adjust quickly to each level he plays at and avoid prolonged slumps. As a second baseman he committed only 2 errors this year and played shortstop and thirdbase as well.